The majority of Western Apache reside in the Fort Apache, San Carlos, Yavapai-Apache, Tonto Apache, and the Fort McDowell Mohave-Apache Indian reservations. The Western Apache are one among five Apache people groups in the United States. 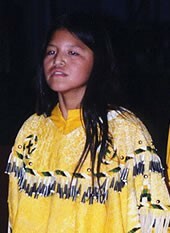 They are the largest populated Apache people and almost all of them still speak their native language. In fact, they seek to maintain their mother tongue passing it on from one generation to another. Teachers in schools are often bi-lingual, speaking both the mother tongue and English. Present day Western Apache work in a wide range of jobs. Some farm the land, others are involved in the tourist industry, while others mine and sell the semiprecious stones. Many are very religious and have many ceremonies centered around spiritual singing and dancing. They also spend a lot of time praying to spirits and gods and believed that supernatural beings were everywhere. However, some are strong evangelical Christians. Pray for evangelical Western Apache to share their faith in Christ with boldness. Ask God to work through dreams and visions to reveal Jesus Christ to the Western Apache people. Pray that messengers of Christ will take the message of Christ to the Western Apache people.